Italian yard Codecasa Yachts has revealed its latest design — a 50 metre superyacht concept. This classic four-deck design features a strong emphasis on straight lines with the raked transom mirroring the angle of the bow, giving the concept a purposeful feel. Designed in-house by the Codecasa technical department, the Concept 50 is strongly reminiscent of the highly successful Codecasa 51 — one of the yard’s most popular designs. What’s more, this 50 metre concept has been designed to have large, comfortable and fully equipped external areas across the top three decks. While interior privacy is ensured by the smoked glass fitted to the large windows. As you would expect from a Codecasa, the 50 metre would be fully customisable to suit a prospective owner’s needs and demands. Despite its impressive size, the 50 is by no means the largest concept that Codecasa has released to date, with the Codecasa 72 metre also in development at the Italian yard. Current in-build projects include a pair of 43 metre hulls from the Codecasa 43 Vintage Series, Hull F76 and Hull C122, which are due for delivery in June 2016 and Summer 2017 respectively. Founded in Viareggio in 1825, Codecasa is one of Italy’s most historic boatbuilders with more than 50 superyachts launched over the years. 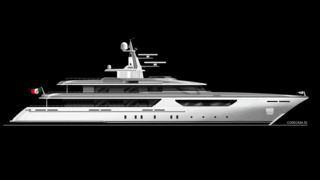 Notable models include Eternity, a 65 metre steel displacement yacht, which was launched in 2010.